More possible dupes today. I'm trying not to buy a lot of polish these days, which is oh-so-hard. Instead, I'm trying to streamline my collection...weed out anything I don't love or have duplicates of. It's a hard thing, as well. I'm a bit of a pack rat, and getting rid of things that I may someday need makes my brain ache. 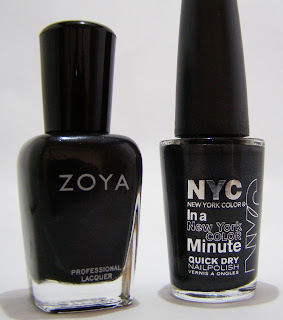 Today, I'm looking at Zoya Raven and NYC Bowery Black. so close. I thought these could be proper dupes. Both are very dark. So dark, in fact, my camera flat-out refused to see a difference. But there is one. Bowery Black is a wee bit less black than Raven. It's more of a dark graphite color. (honestly, it reminds me of a Chanel polish I used to have. I bet it's a dead ringer for that one.) Raven looks a lot more sparkly in the bottle than it reads on the nail. Raven has hardly any sparkle. In dim lighting, it looks like a soft black rather than a shimmery one. It's a great polish though, and opaque at just two coats. The shimmer is super subtle, almost an afterthought in this polish. If you want a black with just a hint of life, this is your color. Bowery Black is very gray. Even more like graphite than it appears in the bottle. The shimmer in this is very up-front. Packed with it, in fact. The polish is quite thin for a color this dark. It took three coats to reach opacity with this one, but the polish dries quickly and lays flat. Out of curiosity, I tried two coats of Bowery Black over a plain black cream. I was hoping that the dark base would deepen the color, making it closer to Raven. To my surprise, it made no difference at all. The shimmer is so central to this color that unless you used a vastly different color I think it would overpower just about anything. Look, I do indeed have a thumb! Definitely not dupes. Not even close, when you actually apply them. But if you aren't picky, the Bowery Black is a much better bargain. It is just $1.99 compared to $7-$9 for the Raven. I say they are different enough to have both. The formulas are decent-to-awesome, and both are lovely colors. It is! And it is surprisingly shiny for a fast-dry polish. I really like everything from that whole line.